The S&P 500 is up 19.2% from its December lows, fueled mostly by optimism over a pending trade deal. Such a strong rally means valuation is more important than ever. 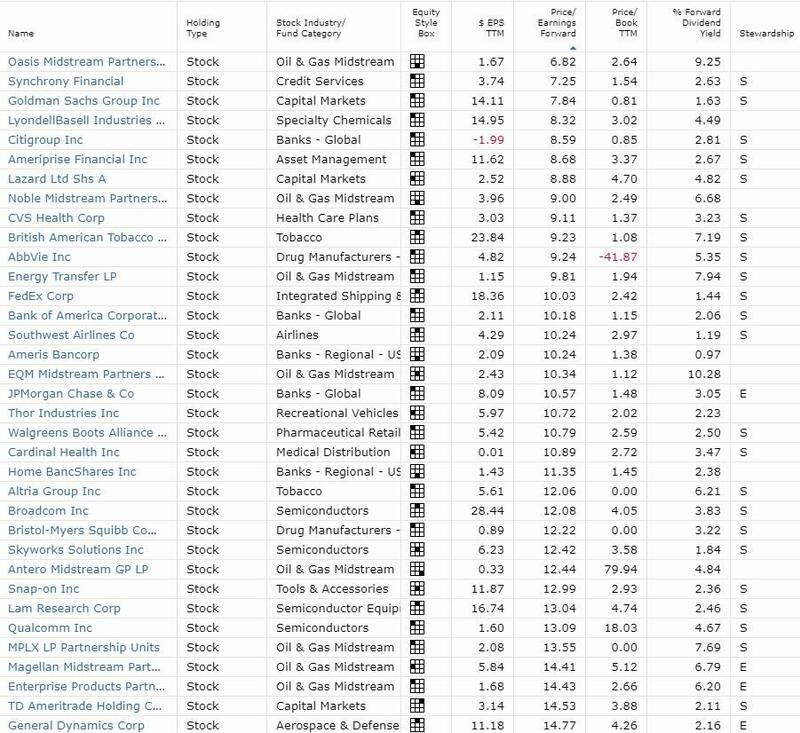 DVDGP owns 25 Morningstar 4 and 5 star rated companies ("strong buys" and "very strong buys"). It also owns 34 companies trading at 15 times forward earnings or less. This week, there are 69 active buy recommendations from the Deep Value Dividend Growth Portfolio's five watchlists. These include high-yield blue-chips, fast growers, as well as Dividend Aristocrats and Kings. Each of these companies is a good buy today, and many are likely to benefit from a potential trade deal in March. Note that due to reader requests, I've decided to break up my weekly "Best Dividend Stocks To Buy This Week" series into two parts. One will be the weekly watchlist article (with the best ideas for new money at any given time). The other will be the update on the Deep Value Dividend Growth Portfolio (which is beating the market by 9.9% so far and across all time frames). To also make those more digestible, I'm breaking out the intro for the weekly series into a revised introduction and reference article on the 3 rules for using margin safely and profitably (which will no longer be included in those future articles). Even the best companies can make terrible investments if you overpay. 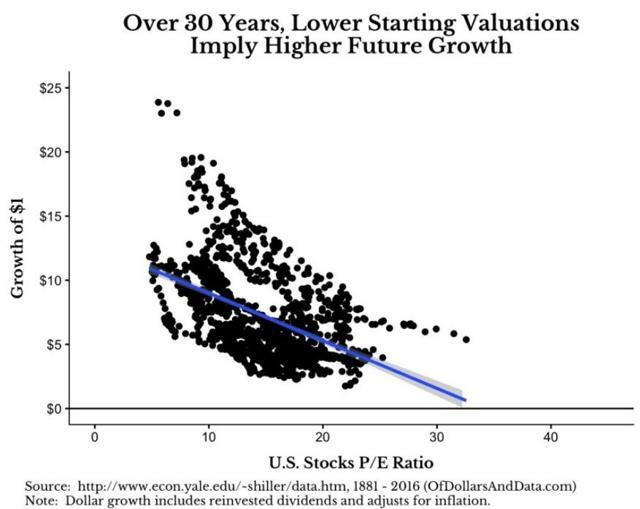 A Yale study looking at market returns from 1881 to 2016 found that starting P/E ratio had a significant effect on total returns out to 30 years. 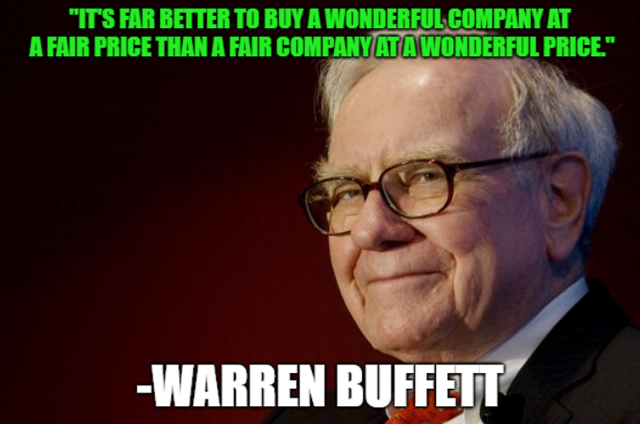 In other words, buy-and-hold investors can't just blindly buy great companies at any price but need to remember Buffett's famous quote: "It's far better to buy a wonderful company at a fair price than a fair company at a wonderful price." The corollary to that quote is what I call "the Buffett rule," which is to never pay more than fair value for even the highest-quality companies. Doing so will lower your total returns, and since something great is always on sale, there is no reason to jump the gun on buying quality, low-risk dividend stocks. After all, patience is the ultimate virtue of the long-term investor, because as Buffett also said, "the stock market is designed to transfer money from the active to the patient." But there's another reason why valuation is always worth keeping in mind. Value investing is one of the proven "alpha factors" that consistently beat the market over time. That includes January's rally (the strongest S&P returns in January in 32 years) when value stocks were the best alpha strategy of all. Of course, value investing doesn't work all of the time - no investing strategy does. But it's precisely because all investing strategies go through periods of underperformance that alpha factors keep working over decades. If any single approach could guarantee market-beating returns year in and year out, then everyone in the world would use it, and thus, the strategy would lose its edge. Ok, so maybe value investing is great, and valuation worth keeping in mind before buying any stock. But how does one find great companies trading at Buffett's mythical "fair value." Well, there are many approaches, but I personally consider three the most useful for long-term dividend growth investors. Fundamentally, any company is worth the present value of all its future cash flow. That's as basic a valuation method as you can get. However, in reality, the future is uncertain, and the discount rate you use, as well your growth assumptions, can make a DCF model say pretty much anything you want. This is why I consider Morningstar's 100% long-term, fundamentals-driven and conservative analysts to be a great source of DCF estimated fair values. Those analysts generally assume slower growth than the analyst consensus and even sometimes management itself. As a result, Morningstar four and five star rated companies can be thought of as "strong buy" or "very strong buy" recommendations, respectively, from analysts whom I consider among the best in the business. Above you can see the top-rated companies that my Deep Value Dividend Growth portfolio owns. Every company presented here is one that my own long-term, valuation-adjusted total return model (based on the one Brookfield Asset Management has been using for decades) expects to generate at least 13% long-term total returns (margin of error 20%). Note that only the companies with "5-star prices" are ones that Morningstar has done a deep dive on. The "Q" rated companies are merely compared to their peer groups, and thus, not necessarily as reliable. But DCF is far from the only valuation method you should consider. Remember that Yale valuation study that looked at stocks based on P/E ratio? Well, the venerable P/E ratio is one of the most popular valuation approaches, and for good reason. While no valuation method is perfect, a good rule of thumb (from Chuck Carnevale, the SA king of value investing and founder of F.A.S.T Graphs) is to never pay more than 15 times forward earnings for a company. 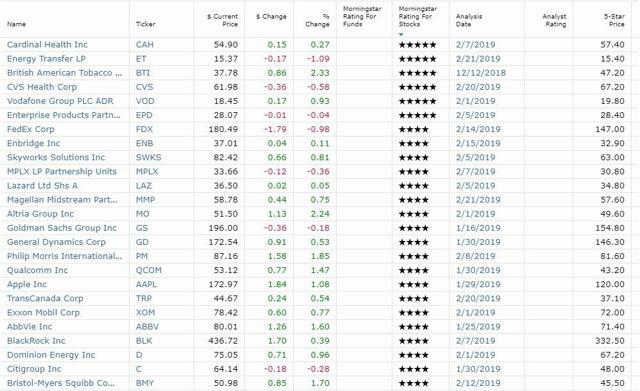 Chuck usually compares companies to their historical P/E ratios, and he's ranked in the top 1.5% of all analysts tracked by TipRanks (based on the forward 12-month total returns of his recommendations). 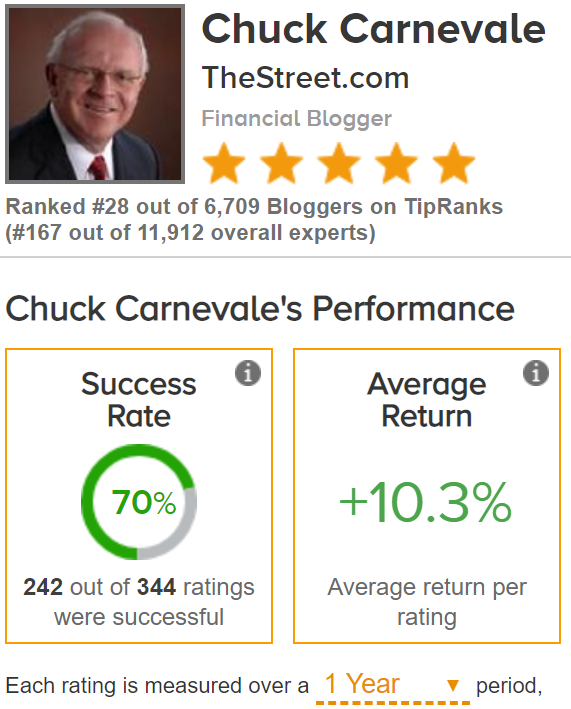 While 12 months is hardly "long term," the point is that Mr. Carnevale is a fantastic value investing analyst, and so, his rule of thumb is well worth keeping in mind. Here's DVDGP's portfolio holdings that have forward PEs of 15 or less. Note that stewardship ratings is Morningstar's estimate of the quality of the management team. P = poor (DVDGP's policy is to avoid all such companies), S = standard (average to good), and E = exemplary (very good to excellent). The above companies are not just deeply undervalued, but many of them are trade and economically sensitive (directly or indirectly) and thus likely to benefit from a comprehensive trade deal. Reuters is now reporting that US/China officials are drafting six memorandums of understanding covering every issue, ahead of a potential total end to the trade war in late March (when Trump and Xi now appear to be meeting). That deal will now apparently include China committing to buying $1.2 trillion in US goods, including vast amounts of energy, and technology. That makes undervalued industrial and energy companies potentially strong "trade plays" and financials too will benefit (due to a trade deal boosting the US and global economy). But while both DCF and forward P/E are great methods to value a company, personally my absolute favorite, and what I use to invest my own money and make most of my recommendations, is Dividend Yield Theory, or DYT. This is how I create my five watchlists, which I intend to use to invest all my savings for the rest of my life. 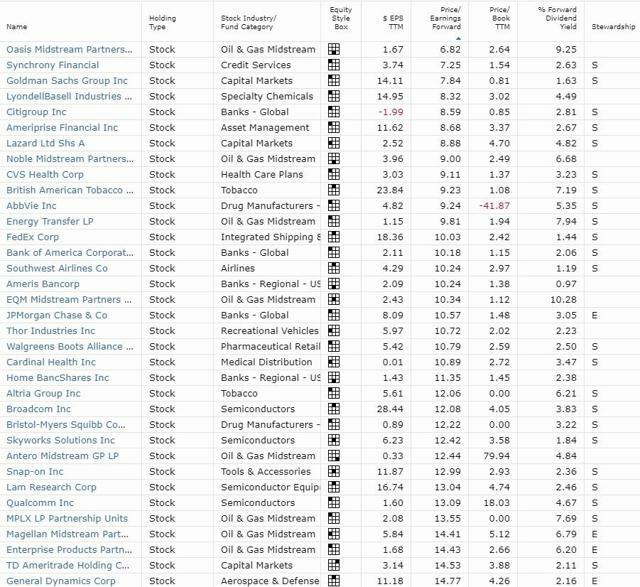 This group of dividend growth blue-chips represents what I consider the best stocks you can buy today. 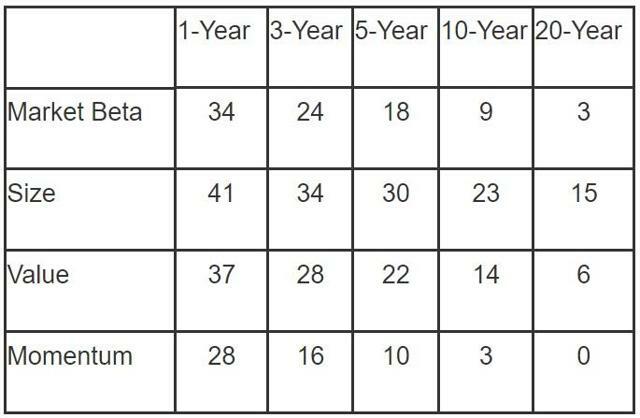 They are presented in five categories, sorted by most undervalued (based on dividend yield theory using a five-year average yield). The goal is to allow readers to know what are the best low-risk dividend growth stocks to buy at any given time. You can think of these as my "highest-conviction" recommendations for conservative income investors that represent what I consider to be the best opportunities for low-risk income investors available in the market today. 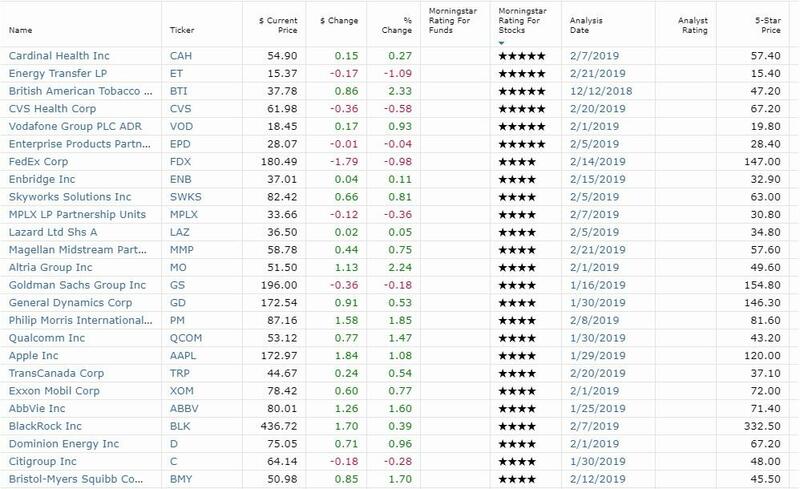 Over time, a portfolio built based on these watchlists will be highly diversified, low-risk and a great source of safe and rising income over time. The rankings are based on the discount to fair value. The valuations are determined by dividend yield theory, which Investment Quality Trends, or IQT, has proven works well for dividend stocks since 1966, generating market-crushing long-term returns with far less volatility. That's because, for stable business income stocks, yields tend to mean-revert over time, meaning cycle around a relatively fixed value approximating fair value. If you buy a dividend stock when the yield is far above its historical average, then you'll likely outperform when its valuation returns to its normal level over time. For the purposes of these valuation-adjusted total return potentials, I use the Gordon Dividend Growth Model, or GDGM (which is what Brookfield Asset Management uses). Since 1956, this has proven relatively accurate at modeling long-term total returns via the formula: Yield + Dividend growth. That's because, assuming no change in valuation, a stable business model (doesn't change much over time) and a constant payout ratio, dividend growth tracks cash flow growth. The valuation adjustment assumes that a stock's yield will revert to its historical norm within 10 years (over that time period, stock prices are purely a function of fundamentals). Thus, these valuation total return models are based on the formula: Yield + Projected 10-year dividend growth (analyst consensus, confirmed by historical growth rate) + 10-year yield reversion return boost. For example, if a stock with a historical average yield of 2% is trading at 3%, then the yield is 50% above its historical yield. This implies the stock is (3% current yield - 2% historical yield)/3% current yield = 33% undervalued. If the stock mean-reverts over 10 years, then this means the price will rise by 50% over 10 years just to correct the undervaluation. That represents a 4.1% annual total return just from valuation mean regression. If the stock grows its cash flow (and dividend) at 10% over this time, then the total return one would expect from this stock would be 3% yield + 10% dividend (and FCF/share) growth + 4.1% valuation boost = 17.1%. The historical margin of error for this valuation-adjusted model is about 20% (the most accurate I've yet discovered). (Sources: Management guidance, GuruFocus, F.A.S.T. Graphs, Simply Safe Dividends, Dividend Yield Theory, Gordon Dividend Growth Model) Note: Margin of error on total return potential is 20%. (Sources: Management guidance, GuruFocus, F.A.S.T. Graphs, Simply Safe Dividends, Dividend Yield Theory, Gordon Dividend Growth Model) - Note margin of error on total return potential is 20%. These are the blue-chips which I expect will generate 13+% total returns at their target yields. Note that all total return estimates are on a 10-year annualized basis. That's because total return models are most accurate over longer time frames (5+ years), when prices trade purely on fundamentals and not sentiment. This allows valuations to mean-revert and allows for relatively accurate (80% to 95%) modeling of returns. The list itself is ranked by long-term CAGR total return potential from target yield. Stocks at their target yield or better (bolded) are good buys today. It's uncertain how much upside is left for the market should we get a comprehensive trade deal in late March. That will depend on the terms of the agreement, including whether or not last year's tariffs are completely eliminated, and how much and how fast China ramps up US imports. But no matter what the final deal looks like, or how the market reacts to the news, quality undervalued dividend stocks, especially trade/economically sensitive coiled springs, are the best buys you can make ahead of any potential agreement. This weekly watchlist series is all about pointing out the best long-term dividend growth stocks I know of so that you can always have a good place to put your hard-earned money to work. Every one of these companies is one I'm confident will deliver safe and growing dividends over time, as well as market-beating, double-digit total returns. After all, it's based on the five watchlists that I intend to use to invest all my weekly savings for the rest of my life, so you can be assured that I'm dedicated to ensuring each company's quality and long-term growth prospects, and verify both on a quarterly basis. Right now many of the most undervalued companies are in the energy, financial, and industrial sectors, all of which should benefit directly or indirectly from an end to the trade war. Fortunately, my five watchlists are packed to the rafters with quality names in these sectors. Disclosure: I am/we are long ENB, KIM, BPY, BLK, ITW, TXN, AOS, AAPL, ABBV, BEP, MMM, LEG, WBA, EPD, MMP, ET, GS, XOM, MPLX, V, MA, BIP, TERP, IRM, HD, SWKS, PM, OKE, C, AMT, BAM, LRCX, JPM, BAC, AMGP, LYB, BTI, TU, SPG, AMTD, BA, CONE, LOW, BMY, AMP, QTS, AY, EQIX, SWK, EPRT, GD, D., LAZ, QCOM, CVS, VOD, APD, AMP, HOMB, SYF, OMP, NBLX, EQM, SU, ABCB, ZTS. I wrote this article myself, and it expresses my own opinions. I am not receiving compensation for it (other than from Seeking Alpha). I have no business relationship with any company whose stock is mentioned in this article.